While it is certainly possible to draw out extracts that are extremely high in THC and CBD with CO2 and hydrocarbon extraction and distillation, but THC-A and CBD crystalline opens up different potentials for storage and consumption to the market. For instance, storage is much more convenient when using crystalline isolate, less messy when dabbing, and easier to incorporate into foods and topicals (presuming you have decarboxylated your crystals). Did I mention that it is also very pretty to look at? 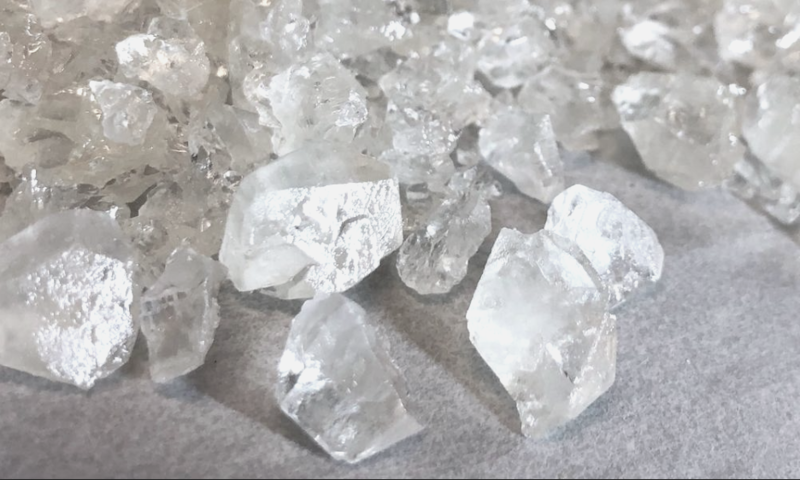 You may be familiar with extractions, and if you’re not feel free to check out this article here discussing the two main types to refresh your knowledge, either way, in order to form crystals you must start with a cannabinoid-rich cannabis extract. Ideally, in order to maximize on time and resources, A-grade flower with a high THC-A or CBD count (depending on what you’re isolating) will be blasted with CO2 or butane/propane in order to extract the greatest yield of cannabinoids from the plant material. The crude oil that is extracted isn’t completely “clean” and will typically have a fair amount of waxes and lipids emulsified within the oil. Once the crude oil is winterized and the major waxes and lipids are filtered we would be left with cannabis extract that could be placed within a vape cartridge or dabbed on a rig. However, this oil will range from 65-90% THC or CBD and still exist within a viscous/fluid state. In order to solidify the cannabinoids out of the remaining non-cannabinoid material, we must take the cannabis extract add different solvents in different stages and run it through a number of different filtrations. The first step is to take your cannabis extract and mix it with acetic acid and hexane, the combination of chemicals will act as a solvent to separate the dissolved plant matter from the THC/CBD. After the mixture has had time to settle, it is put through a filter and then the remaining fluid is placed within a roto-vape where the acetic acid and hexane are evaporated off. The remaining mixture will be primarily Delta-9 THC-A or CBD-A. In order to further purify the extract, chromatography is used in order to separate impure elements of the solution from the desired cannabinoids. Chromatography (sounds complicated but isn’t really) is a chemical process where different materials and mediums are used to separate different components within a solution based on its affinity to the different filter mediums and density (kind’ve like your standard water filter). In the instance of THC-A, chemists add Sephadex-LH20, dichloromethane and chloroform in order to further clarify the cannabis extract into majority cannabinoids and solvent devoid of any plant material. The remaining solvent from the mixture needs to be evaporated, so it is placed within the roto-vape again, where it crystallizes. Afterwards, in order to make the crystals consumable, they go through a series of chemical washes, filtrations and roto-vaping. Post chromatography, the crystals are dissolved in methanol and then filtered and then roto-vaped to remove the methanol. Afterward, pentane is used to remove the smallest bits of non-THC or non-CBD material and then roto-vaped for the last time. The results, white crystals testing at 99.97% cannabinoid. The only caveat to this is that you will not have the accompanying terpenes, and therefore will not experience the “entourage effect” that cannabis flower provides. However if you are intent on re-creating such an experience, you can reintroduce cannabis terpenes into your crystalline, or simply soak it within “terp sauce”. *Disclaimer, this post is for informational purposes only, the chemicals mentioned above are caustic and dangerous. We do not recommend you try this. This is not a tutorial.